DARICE-To Go Storage System Crafty Caddy. Great for storing beads, embellishments, buttons, notions and more! 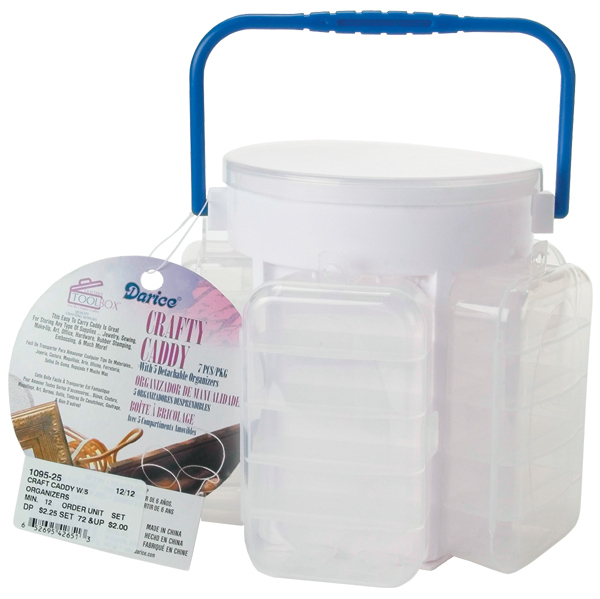 This caddy features five detachable clear organizers (1x4-1/2x2-1/2) each with five compartments, a lid that removes to reveal a round organizer (1x4- 1/2x4-1/2) with six compartments, and a large storage area underneath the round organizer. It has a carry handle and each organizer snaps tight for safe and secure storage. The caddy measures 5-3/4x6-1/4x6-1/4in. Made of durable plastic. Imported.